GENRE: realistic, epistolary novel in letters, photos, "stuff"
SUMMARY: Sequel to: Middle School Is Worse Than Meatloaf. Ginny's eighth grade year is not shaping up the way she had hoped. Her family is moving, her stepdad just lost his job, her older brother is always in trouble, and now her mom is pregnant. Told through poems, notes, refrigerator magnets, trash cans, Instant Messenger, and lots of other "stuff" from Ginny's life. FOR ELA TEACHERS: Need a lesson on inferencing? Since the story and its characters are presented 100% through Ginny's stuff, the author really "tells" us nothing, so students have to use clues from the pictures to figure out what's going on. Check out p. 48-49, p. 67, p. 81-82, and p. 93 for a few great examples that students will understand, even if they have never read the book! REVIEW: I've heard that you can tell a lot about people by going through their trash, and that's kind of what this book is like. I know of no other books that are quite like this one. The format is super-unique, and surprisingly, "stuff" really does tell a story. Believe it or not, there's character and plot development! It is laugh-out-loud funny at times and heartbreaking at others. A picture really does say a thousand words! I loved this book's predecessor, Middle School Is Worse Than Meatloaf when I first read it years ago. When I am recommending books to girls who really, really don't like to read, these two books are among my first choices. They are easy to read and nonthreatening for young girls for whom reading is an absolute chore. Sure, it's not the greatest literature out there, but for reluctant readers, just having an enjoyable reading experience is a HUGE step towards becoming less reluctant. I have yet to find a girl who didn't MSIWTH, and now there is a sequel to go with it. Yay! A word about the illustrations. Elicia Castaldi, you are a genius. How did you ladies come up with these pages? They are so simple and sparse, yet they say so darn much. The illustrations and photos realistically portray an eighth grade girl's life. I love all the classic and contemporary book references and the English teacher who constantly says "Awesome!" I love the picture of little brother Timmy's homework and how you can totally tell Ginny did the bottom part of it for him. I love how toilet paper is ALWAYS on the grocery list, Timmy's handwriting, and all the little clues about the family's financial problems. So subtle. So real. 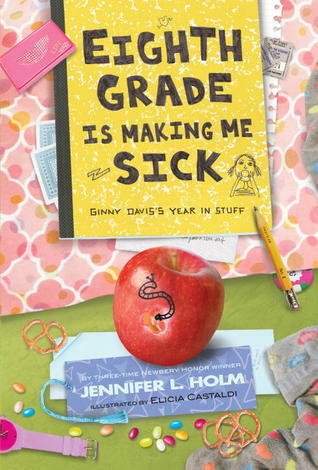 THE BOTTOM LINE: Great books for reluctant readers can be hard to come by, and Eighth Grade Is Making Me Sick is perfect for reluctant reader girls. This book and its predecessor are absolutely essential for middle school libraries. STATUS IN MY LIBRARY: We have both Holm/Castaldi books, and I recommend them frequently. They are well-loved in our library! Writing: 5/5--major props to the illustrator also!